WHAT IT ISN'T: This is not a how-to wrestle dvd, although martial artists of any experience will get something out of it. This is not a Panther video where something is shown in real-time and then that is repeated a few times in slow-motion, in addition to different angles to eat up the time. WHAT IT IS: 60 minutes of an insider's look into a world 90% of us (if not more) will not have access to, nor have the inclination or resources to go researching by ourselves. 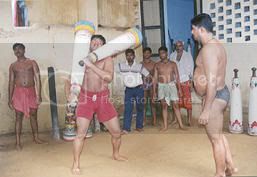 Mr. Giordano, not only visited one akhara, but at least five (I lost count after five), to present a documentary that details the broad spectrum of how the dying art of Indian wrestling, kushti, is to-this-day still practiced. There are similarities as well as differences in the akhara as well as training methods. What you get is a little of the old methods, a little of the new methods. When the modern MAist hears/reads "old methods", they sometimes immediatedly equate old with antiquated/outdated. This may be true with some things, but with the physical culture as well as the martial arts, this may not be true. Sometimes seeing is believing and after you have watched this DVD, you will believe that that cliche is untrue. To see everyday grappling students practice in such spartan conditions with makeshift equipment is awe-inspiring. And add in seeing what looks to be a 6 yr-old boy doing what the adults do is definitely a sight to behold. The bulk of the DVD is on the training methods as well as the training equipment themselves. This is like the icing on the cake of the DVD. The viewer is exposed to varying training apparatus from the clubs to the rope and pole and the routines that some wrestlers follow. 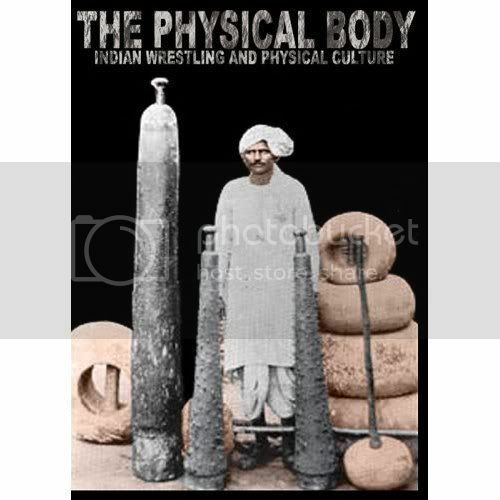 You owe it to yourself to check out this DVD if you are into grappling or physical culture, as well as MA history. It is professionally produced and it shows in the quality of DVD transfer. I recommend this DVD wholeheartedly and look forward anxiously to Mr. Giordano's future projects. Of personal interest is his upcoming books/DVD's on South-East Asian bareknuckle styles as well as the weaponry styles of the region.